This needs to be fixed as women in sub-Saharan African suffer from the highest maternal mortality ratio in the world. Close to 550 women die for every 100 000 children that are born. This amounts to 200 000 maternal deaths a year – or two thirds of all maternal deaths per year worldwide. Improving the access and availability of caesarean sections on the continent is therefore pivotal to reducing the number of maternal deaths and to achieve the sustainable development goal on maternal health of reducing maternal deaths to less than 70 per 100 000 live births by 2030. The organisation has not identified an ideal caesarean section rate, however there’s evidence that rates above 20% at country level might be to too high. But it encourages governments to make every effort to provide the procedure to women in need of it. 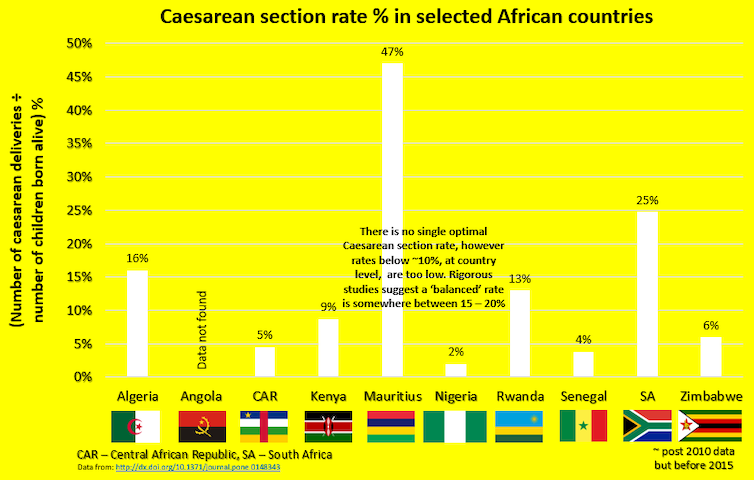 Africa has the lowest caesarean section rate in the world. In Europe about a quarter of births are conducted via caesarean section while Latin America and the Caribbean have caesarean section rates of about 40.5%. In Africa only 7.3% of babies are born via this method. But it’s a very mixed picture across the continent. Some countries have very high rates such as Egypt (51.8%) and Mauritius (47%), the highest in Africa. And despite a 2.9% overall increase across the continent from 1990, there’s been a decline in some countries like Nigeria and Guinea which now stands at about 2%. Zimbabwe has maintained its caesarean section rates at 6%. Caesarean sections often happen at the end of a series of complex events. There can be both pre-existing and pregnancy related complications. The need for caesarean sections can be aggravated by a range of issues such as delays in accessing the appropriate level of care, transportation delays as well as a shortage of necessary technologies.